Getting started with the Young Living Weight Loss Trio seems like a great way to kickoff the swim suit season. 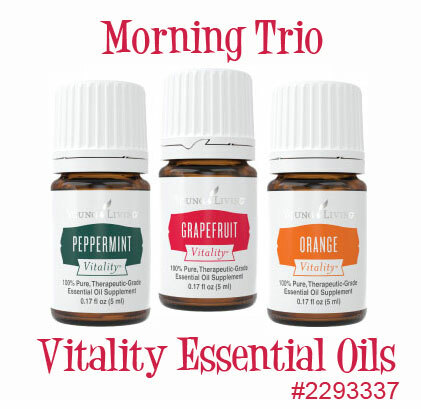 Just three oils are needed and two of them are in the Premium Kit #WIN! These three are one the inexpensive side too and also have a TON of other uses. Weight Loss Trio Supplies are easy! 1 Bottle Peppermint Essential Oil 5 ml Peppermint helps flush fat. If this is your first time using your oils, or if you have only used them for a short time these are the instructions I’m following. Day 1-3: One drop of Lemon, one drop of Peppermint, and one drop of Grapefruit (if you are using it) in a capsule then fill the rest of the capsule with a carrier oil. Take 1 capsule in the morning first thing with at least 8 oz of water, 30 minutes (at least) before breakfast. Day 4-7: Continue with one drop of each oil, but increase and take another capsule in the evening again with 8 oz of water. If you have been using your oils for a little while (say a couple of months), then you may wish to start with 2 drops of each oil in a capsule 2x/day. Wherever you are starting from – if you pre-make your capsules, make sure you freeze or refrigerate the capsules in a glass jar. If they sit out the capsules will dissolve. I’m a newbie to oils so I’ll be doing the 3 oils with probably a little of the citrus fresh thrown in because I really adore both the smell and the taste of it in my water. Click here to find out how to sign up as a wholesale customer and get the essential oils at a 24% savings along with an amazing support group called the LemonDroppers to guide you in your journey to get healthy. Does it matter if you drink the weight loss trio or put it in a capsule? This question comes up a bunch! It doesn’t really matter if you put the essential oils in a capsule or drink them with water, however from experience I can tell you, doing the capsule twice a day is just much easier and you are less likely to forget. Or do what I do.. in the morning I have my Oily Smoothie with the citrus oils in it and put the peppermint drops in my giant glass of water every morning. Then before dinner, I take my capsule. The important part is being consistent. An even more economical essential oils weight loss regimen was mentioned in this testimonial for using the Citrus Fresh both in water and topically as it contains both Grapefruit, Lemon along with Orange (Citrus aurantium), tangerine (Citrus nobilis), Mandarin (Citrus reticulata), grapefruit (Citrus paradisi), lemon (Citrus limon), and spearmint (Mentha spicata). It’s only $7.25 wholesale pricing ($9.54 Retail) and you can diffuse, drink in your water, (I’ve been doing that for over a week.. it’s YUMMY!) or put it in capsules with the carrier oil. As always, check with your doctor to make sure that these essential oils don’t conflict with anything you are already doing or any medications you are taking and start slow. 1 drop of each in a capsule to start as these are powerful little drops of goodness and they are working to detox and for me have helped me get past my sweets craving that overtakes all sense during the holidays. You can just put them in water twice a day too, but some don’t like the flavor. That’s totally up to you and I’ve been putting Citrus Fresh in my water for about a week now and am loving it AND the fact that it’s helping me drink more water. I’m just starting too so feel free to post any questions about this on the Facebook page and I’ll do my best to get back to you. DO make sure your oils are food grade. Not all of them are, in fact, many of them sold in the health food stores are only 5-10% essential oil and the rest fillers. Many of them are just made for scent and just don’t pack the punch that Young Living Oils do both in a diffuser, topically or ingested. *The statements made in this post have not been evaluated by the Food and Drug Administration. The products are not intended to diagnose, treat, cure, or prevent any disease. As with any Weight Loss Program, a good diet of balanced, healthy foods and regular exercise will help you reach your weight loss goals. All prices are the current wholesale prices at the time of this blog posting and may change at any time. Pricing may vary. Disclaimer: I am not a medical professional. The information provided is not intended to treat or diagnose and has not been evaluated by the FDA. Please consult your physician before beginning any new regimen or if being treated for any illness or health condition. Use a variety of essential oils and rotate those which you use often to avoid sensitization and irritation. If you use a blend for 3 days, take a minimum of 3 days off and use an alternate blend those 3 days. The following essential oils should be avoided during pregnancy: Single Oils: Basil, birch, calamus, cassia, cinnamon bark, hyssop, Idaho Tansy, jasmine, lavandin, mugwort, rosemary, sage, tarragon, thyme, wintergreen. Synergistic Use the following with caution: Single Oils: Angelica, cedarwood, chamomile (German/Blue), cistus, citronella, clary sage, clove bud, cumin (black), cypress, davana, fennel, bay laurel, marjoram, mountain savory, myrrh, nutmeg, peppermint, rose, spearmint vetiver, yarrow. Always take precautions with using Aromatherapy. If an essential oil or essential oil blend gets in your eye, flush the eye immediately with a carrier oil or cold mil. Seek medical attention if the stinging and/or irritation continues. Do not use more than 2 drops of the following essential oils when used in a bath the first time: Aniseed, Black pepper, Camphor(rectivied), Citronella, Clove Eucalyptus globulus, Ginger, Juniperberry, Peppermint, Sage, Spearmint, Thyme. A couple drops in your water any time or your smoothie or cocktail. Use a couple drops in recipes for lemon bread, lemon bars, lemon vinaigrette or kick up your box muffin recipe. Pure lemon oil is more potent than extract which is diluted with alcohol so it’s not a 1:1 ratio. Less is more and taste and learn your preference. Add to a bowl of water for a natural fruit and vegetable rinse. Blend a drop of Lemon Vitality in Einkorn Pancake & Waffle Mix batter and top your waffles or pancakes with fresh fruit for a healthy, tasty breakfast. Peppermint Vitality™, part of the Young Living Vitality line for culinary and dietary use, is a versatile oil with a well-loved flavor. As a dietary supplement, Peppermint Vitality oil can support healthy gut function and digestive efficiency. * These benefits make it a great way to start your day or end a meal. Additionally, Peppermint Vitality oil as a dietary supplement may support exercise performance to help you have a great workout. Add 2–3 drops to a water bottle or glass of water for flavor, or mix it with other Vitality essential oils for various flavor combinations. Infusing water with dietary essential oils is a great option for anyone who struggles to swallow pills and capsules. Need more ideas? Check out the Essential Oils Recipes and Crafty Side of Essential Oils on Facebook. Need oils? Click here to find out how to sign up as a wholesale customer and get the essential oils at a 24% savings.